The year 2011 has been yet another period of abject failure by the government to protect human rights, according to the results of a survey released on Monday. Bonar Tigor Naipospos, deputy chairman of the Setara Institute for Peace and Democracy, said the survey of leading rights activists, community and religious leaders and bureaucrats showed no improvement in the state’s efforts to protect rights. “There has been no significant change or effort from the government to uphold human rights compared to the previous year,” he said. Bonar said the category respondents rated the lowest was the resolution of past human rights violations, which received a score of 1.4 on a scale from 0 to 7. Last year’s worst-performing category, the perception of religious freedom, improved from a score of 1.0 to 2.3, while elimination of discrimination dropped from 4.0 to 2.8. “Even though the score for religious freedom improved, one item in that group that still received a low score was the handling of cases of violence against minority groups,” said Ismail Hasani, a researcher at the Setara Institute. 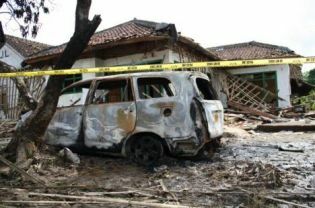 He said that this year the worst of those incidents was the attack by a mob of 1,500 on a small Ahmadiyah community in Cikeusik, Banten province. That attack, in February, led to the deaths of three members of the beleaguered sect. Only a handful of the perpetrators were charged, and wound up receiving prison sentences of just a few months. An Ahmadi survivor who almost had his hand hacked off, though, was charged with provoking the attack and sentenced to six months in prison, half a month longer than his attacker. “Compared to previous presidents, Yudhoyono has the strongest political backing because he was directly elected by the people,” he added. Researchers said that on the positive side, survey respondents were more satisfied with the performance of state bodies such as the National Commission on Violence Against Women (Komnas Perempuan), the Indonesian Commission for Child Protection (KPAI), and the National Commission on Human Rights (Komnas Ham). “Komnas Perempuan received the highest score, with a 3.7, while the KPAI got 3.6 and Komnas HAM got 3.4,” Ismail said. The survey questioned 71 respondents across 13 provinces in the country. It was carried out in September and October and focused on items in international covenants on human rights. Next Article Ahmadiyah bans: Legal justification for intolerance?